This Coffee Cake Amish Friendship Bread submitted by Kitchen Friend Karen is the perfect recipe for Sunday morning brunch with the family. If adding you’re adding chocolate chips to this recipe, eliminate the usual amount of cinnamon. 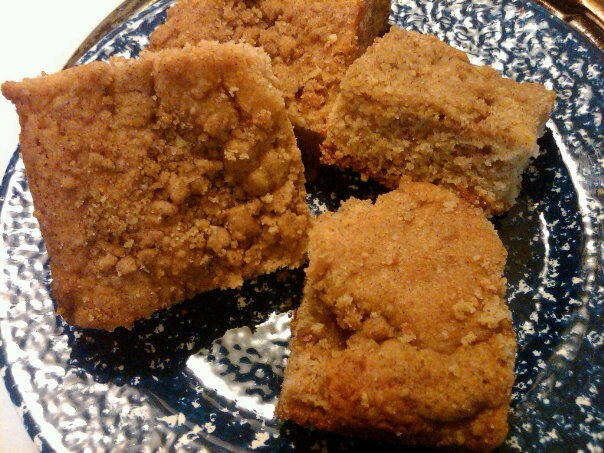 You can also play with the different add-ins in this Coffee Cake Amish Friendship Bread. Throw in a cup of raisins, chocolate chips, apples, or your favorite nuts! This Coffee Cake Amish Friendship Bread is the perfect recipe for Sunday morning brunch with the family. In a large mixing bowl, add ingredients as listed and mix on medium speed. Add 1 cup of your choice of nuts or other add-ins (apples, raisins, chocolate chips, etc.). Pour the batter into cake pan. Sprinkle on Coffee Cake Crumble Topping on top of batter. I saw the comment about using a 9X13, so I tried this, only it was WAY to big for one batch. I made two batches for the 9X13. Also I buttered the pan and instead of flouring it I did a cinnamon sugar mixture. Turned out awesome!! I used the same mixture that I used for snickerdoodles, because I had some left over. couldn’t you cut this recipe to half and use 9 by 9 pan? I wouldn’t, the recipe itself was to small for the 13X9 so I wouldn’t cut the recipe in half to fill a 9 X 9. Made this today for the first time. I substituted 1/2 the flour with King Arthur’s White Whole Wheat flour and 1/2 the oil with unsweetened applesauce. Turned out really good! Thank you for this website and all the recipes – I was recently given amish bread starter for the first time and now I have a lot of it! !